You can say I have an obsessive driven trait that is a big part of my personality- meaning when I decide to commit or put my mind to something, all chips are in and I become tunnel-visioned in order to accomplish a goal, perfect a project, whatever my objective is. I consider this to be a positive attribute - With hard work and focus, I have qualified for the Boston Marathon, trained for and completed 8x Iron-distance tri's, successfully completed my Master's degree and defended my thesis, and beat my brother in bowling this evening (142 over 141 suckas)! However, this same personality quirk has caused me a lot of unnecessary stress and wasted tears. 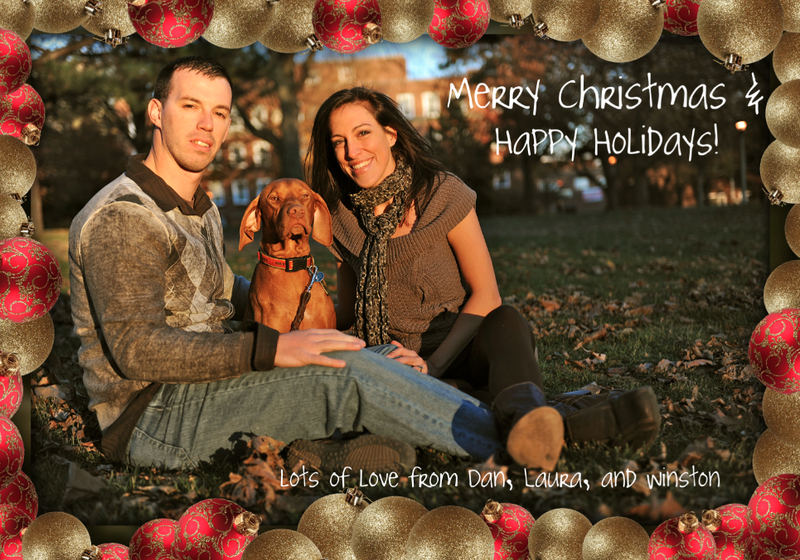 This year as our first Holiday Season as a married couple, Dan and I were so excited to mail out our first Christmas/Holiday cards and show off our little family (i.e. Dan, me, and the dog). We had lots of beautiful pictures to choose from, thanks to Bea Corbin who did a fabulous job with Wheatley family photo's! I also discovered Picnik, and was able to add a cute festive border and a fun message to my card. Choosing the PERFECT photo = 30 minutes. Researching and Printing the "cards" = 60 minutes plus 30 minutes roundtrip to pick them up. We have plenty of envelopes at home, so that shouldn't be an issue. YEAH RIGHT. No big deal, I'll run over to Office Depot, find some envelopes that will nicely fit, and print off some Holiday return address labels while I'm there. First I go to their print center to do the labels. they had a fun computer program where I spent some time picking a cute design with polar bears, a cute font, and well I just loved it. Then I found out I was supposed to ORDER them, they couldn't print them in the store!! Uggh. I wanted them NOW. Oh yeah guess what? The envelopes? The only ones that weren't obnoxious were heavy duty and ridiculously expensive. Dan had called Kinko's, and they told him that they could print address labels there. So I drove over, and they had a cute station as well. I spent more time looking through their templates, and picked a cute one with penguins. FAIL. I was supposed to order those too. They LIED. No luck with envelopes. So I went home, defeated. My awesome husband had already found 4x6 envelopes (green...) and ordered them, so cards were put off until Monday. I should have ordered labels and ended it there. But oh no. Last weekend I wasted about 2 hours making ADDRESS LABELS. I wanted these certain penguin and dog images I found on the internet, but I did not want the white background (so they would fit into the background, overlap, etc. ), and I couldn't figure out how to "cut" the image from the background using picnik, various internet photo-editing sites, or my mac iphoto. Turns out I needed adobe photoshop for the "lasso" and "magic wand" tool. Downloaded the free trial, then played around to create the perfect address label - what to write, the text, moving images, putting into an Avery template in Word...finally, DONE! Time wasted = 2 hrs. Last step was to take my flash drive with the word doc on it to Office Depot, where they can pull the file up, and print them onto labels using their laser printer. So I go there yesterday, and they are BUSY with shipping packages. I pick out the labels that fit the template I used, and they had CLEAR labels - how cool! When someone was finally able to help me, they tell me that their laser printer is not made for EXACT borders like the labels...I said f*$^ it just do it anyway- driven personality was defeated. Done done done. As I'm leaving, I say DAMN... I forgot the envelopes are GREEN!! That totally ruins my winter/blue/white theme I spent so hard creating on the return address labels. I LOSE. Well, I guess I can breathe a sigh of relief that besides addressing, stamping, and mailing that this is OVER! A lesson taught to me to PICK MY BATTLES!! If it makes you feel any better, I do stuff like this ALL THE TIME!! Love the pic!! Me, too!!!!! For next year, Snapfish.com has fun cards that aren't too expensive. That is exactly why we skipped sending out Christmas cards this year. I didn't feel like dealing with the whole experience. :)However, your cards look great and I love the picture! Nicely done! I am such a christmas card procrastinator! This is our fourth married christmas, and I just can't stand getting them all together and sent out! But in the end, I do think the trouble is worth it, it's just annoying! Yours are just beautiful!!! Love the card - this is what matters. I do feel your pain, I have such an A++++ personality. It kills me sometimes but helps others. Yes I know you well and your cards are wonderful right down to the address label! Be proud you did great! Murphey and Allie wanted to meet with Santa to have their picture taken and I was less than thrilled with the way it turned out...but the $ went to the Humaine Society so....jingle bells! Your picture turned out great!